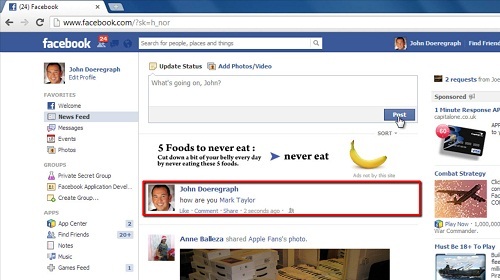 Facebook allows you to ‘mention’ someone in a post by linking to their profile. This appears as their name with a hyperlink to their profile. This tutorial will show you how to make facebook name links. From the Facebook homepage post a status that you want to mention someone in. 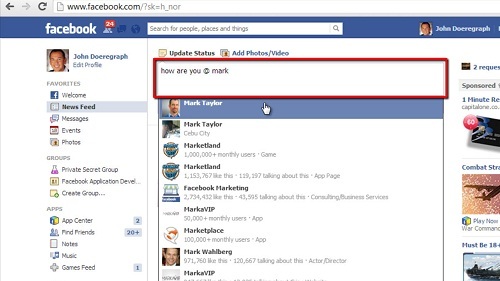 In this example we are entering “How are you”, then type the “@” symbol and start typing the Facebook name of the friend that you want to mention here. A list of names will appear below the status bar and you will need to click on the friend that you want to mention. Their name will appear in your status bar, highlighted in blue. Click “Post” and you will see the status post with name link in place. You can repeat this “@” symbol procedure for any place you can post on Facebook and that is how to make facebook name links.